Despite this habit, all the things I accumulated without even realising it are resurfacing today in a big mess. I have 6 days left in Zurich and a flat full of boxes and half assembled furniture. Getting ready to move reminded me that there’s more happiness in a good book, mental space, and the learning of a new skill than in any of the boxes I’m packing to take away. I arrived in Switzerland with a big suitcase containing all I had. Three and a half years later, I have accumulated much more stuff than could fit in 15 suitcases. Since everything I ship to New Zealand will cost me money, I evaluate how much I need each piece of clothing or home supply before putting it in a box. The result is a huge pile of stuff to throw away or to give: old and new clothes I never wear, candles I’ll never light, half-empty bottles of body cream… Looking at this pile of waste makes me feel ashamed and unhappy. How did I manage to buy so many things and never use them? The big mess isn’t only in my flat, it’s also in my head. I accumulated as many real and imaginary problems in my life as in my closet. Sorting out my stuff allowed me to sort out my thoughts. I don’t want to face the same piles of stuff and mental garbage the next time I’ll move. Hence, I vow to accumulate less in the future: less stuff, but also less problems. Nothing is a problem by itself until I allow it to become one. Sometimes, it makes me feel sad and disconnected to leave friends and family behind. There might not always be someone around to cheer me up in the near future, until I make new friends. But books are always around, and they’ve never let me down. Picking up a good book when you feel blue is the best thing to do, really: you don’t burden anyone else with your silly anxieties, you take your mind off things troubling you, and you escape into a different world. Good writing that touches my heart makes me happy. And reading The God of Small Things reminded me that my Kindle really is my best friend. All I can do to feel a sense of direction in the middle of the big mess that moving away creates is to start getting ready for the journalism school. If you’ve read this recent post of mine, you know about my terrible weakness: I don’t type very fast. I use two fingers and have to look at the keyboard while I type. I took a typing speed test and my score was 30 words per minute. It’s not as appalling as I thought it would be, but there’s room for improvement for a future journalist. Nick took the test as well and gloated for 15 minutes because his typing speed is 85 words per minute. He annoyed me but then he found this website for me to learn how to touch-type. There you can evaluate your typing speed and get progressive lessons to learn this useful skill. As I type this post, I’m still working on my home row (the middle row of keys) plus the letters e/r/u/i. I’m not yet able to type this post without looking at my keybeard but I’m slowly getting there. And it makes me so happy to sit down everyday to do the typing exercises. I give myself a mental high five every time I finish a section and I can see my progress. Doing the touch-type exercises reminded me that learning is vital to my well-being: be it typing, a new language, painting, or writing. Sorting out my life before packing it into boxes brings me back to my basic happiness needs: learning, a good book, and space both in my head and in my closets. I love this, Cecile! It reminds me of the post I published today. I couldn’t agree with you more, clutter and useless junk definitely makes me unhappy. I’ve been evaluating my lifestyle to simplify everything, separating needs from wants and trying to talk myself out of buying things (unless it’s something I really need). I also find making things is way more fun,cheaper and gets us back in touch with the things we use from day to day! Separating needs from wants: difficult but necessary. I’ve also started to spend more on quality things I use and need a lot, and stop buying useless junk. I have a hard time getting started to make things, but it’s always fun in the end to do it. I’d love to learn how to sow to make clothes and stuff. Ce livre de A. Roy est un de mes préférés. Dépaysement total et histoire fascinante. En ce moment, je dévore certains livres de Erri de Luca, auteur napolitain magnifique. Un autre très bon livre quant au “clutter” est celui de Dominique Loreau “L’art de la Simplicité” ou “L’art de l’Essentiel”. De très bons conseils de vie à appliquer partout. Hi! I found your blog as a friend sent me your link (Ms. PC) Seems we all have a clutter affliction! Just wrote about mine on my blog too. The clutter never seems to end! Clutter haunts us all, Europeans and Americans alike! I signed up for your blog by email and on Twitter! Clutter is my life. The one time I was clutter-free was when I studied abroad and was forced to only bring two suitcases (at first I thought I would die). It was such a relief to have only the things I needed. Sadly, I haven’t figured out how to replicate that in my real life. You know a little about my dad’s house, but have I mentioned that we have a huge storage unit filled with furniture and wedding gifts? One of these days, I’ll learn a new skill called organization. Clutter sneaks its way into our houses and storage unitswithout our realising it! Moving out of a place without any storage option is a radical way to get rid of all the stuff we don’t need or don’t use. I hope I’ll buy less useless stuff in the future! I’m sure you accumulate less now that you’re in your dad’s house though, no? Hi Cécile, here’s to you. What surprised me most was how much better your writing became so quickly. And that you do it in a second language is really amazing, and puts blokes like me to shame. I especially appreciated how your blog amused us on one level, but sent another interpretation always lurking beneath. I first recognized you doing it in your early stories on personality, but they all of seemed to leave a taste of revelation. “Oh, you’re just reading into it,” I’d think, but then you’d do something like summarizing your teaching techniques and I’d snap my fingers. I am so glad you’ve chosen a career with no glass ceiling; no one is going to hold you back. Watching you brush off a lot of hard work in literature and law studies because the disciplines didn’t live up to your expectations made me chuckle; maybe you don’t see the consequences. It made me curious enough to find the Canterbury course syllabus for your next project, wondering what kind of challenges you were after. Looks good, and classes of twenty are perfect, so you’ll surely keep everyone on their toes. Going to the other side of the world with Nick on the solstice, you get extra credit for timing and location, a perfect way to stimulate your life. I just have this terrible feeling that you are going away, and won’t have enough time to post. So, I’ll finish my toast to you and Nick here with sincere wishes for a long and happy voyage together, lots of discovery and adventure, a head full of ideas, and the skills of writing stories we’ll all tuck away in memory. Thanks for your well wishes and here’s to you, Whitt! We’ve grown to like the main character in your story, Cécile. She’s never really serious, just a bit self-conscious, ready to challenge, full of youth. Are we supposed to believe her (is she really a thief ? ), or just laugh ( more about her curlicues? )? If we’d been girls, would we have reacted like that?? (maybe)), or even, I remember someone like that (sort of). You, a writer, may strive to be conscious of our viewpoint, but you can’t; you’re not us. That, I suppose, is what you mean by ‘trying to be conscious.’ For me, you craft good stories that reveal life in a new light. It’s refreshing to see Cécile growing up in different world, observe her discoveries, learn her strengths and weaknesses, hear what she considers important etc. I guess it’s a combination of the different levels you apply to the character and the story, what you put in subconsciously or even unconsciously, and the amount we bring to the story. Sorry, I didn’t mean to provoke your curiosity. Besides, people seldom reply to toasts; they usually just sit there. Another time, another place. Bon Voyage, stay smart, and keep in touch. Oh, I agree with Dr. Phil…ahem..Dr.Whitt here. I’ve grown to love Cecile. She is very interesting, sweet, strives to see the kindness in strangers, loves to see goodness everywhere she looks, embarks on exciting adventures, works hard, writes beautifully, represents a sassy french lady in a new light. I love every post of yours. You are no longer ‘trying to be conscious’…you are ‘crystal-clear conscious’ for me. This and every word Dr.Whitt has said above. 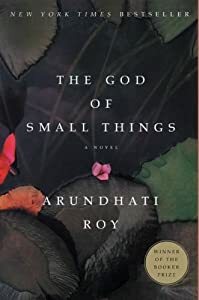 God of small things, huh. I’ve read it once, just once and promised myself never to read it again. Such intensely heavy emotions and drastic measures filled books pull me down. The immense sadness that the book spreads right from the first page is unbearable. But, the book will definitely appeal to others who are unfamiliar with Indianness. By the way, I love the quote of Ammu. I don’t remember it though. P.S. How do you make the accent on the first ‘e’ in your name? To make the accent, you need a French keyboard, or just copy paste it from somewhere. Hi Iris; On the accents: When you have the “New Post” page on your screen, go the formatting line (begins with B, I) and click on the last icon, the “kitchen sink,” and there under Omega, you’ll find all the strange characters you’ll ever hope to meet. And I did really steal small things in the supermarket… Funny and flattering how many people have a hard time believing it! Seeing what you can get away with, huh, and from a law student. :) Guess we just don’t want you to get caught. I am where you are, I believe. Once a week, my cleaning person works on the house and then, for an hour or so, she helps me to pour through stuff and throw a lot away. So far, about I have removed about 4 boxes that would each almost hold a chair and have a large box of papers to be burned. Along with this, I am thinking, just as you are. Clean home, uncluttered mind (I would say “clean” mind, but well, not all thoughts are clean now are they lol). Glad you’re decluttering as well. It’ll feel good when you’re done. I think it is true that less stuff and less clutter (metal and physical) equal more happiness. When I travel and then return home, I always feel like I have too much “stuff” and I end up purging–and it feels so amazing for a while. And then I slowly build up my collection of junk I don’t need again. Glad you’re liking the book! It makes me happy to have successfully recommended it. And I agree with you on the kindle thing; it helps to reduce the burden of so many possessions. Plus I love the built-in dictionary and miss it when I go back to physical books. I’m also totally addicted to the built-in dictionary. English being my second language, it’s been a mini-revolution for me to be able to learn new words so easily. I think chatting is what took me to 30 wpm already. Once I’ll be done with the touch-typing training, I’ll chat again to practice. Thanks for the tip! De-cluttering can be very carthartic. And do we need these things? Possessions, I guess, can give a sense of place; of identity. But really, as you point out, we need to find those things within ourselves. I should add that there are many ways of obtaining fresh clutter, in New Zealand, including by prowling some of the second hand bookshops. There is a fantastic one in Auckland, particularly, which it is impossible to leave without buying something! It’s true that possessions give us a sense of place and identity. But it’s good to be able to feel these things when all our possessions are packed in a few boxes too. They have stock of 90,000 books! I find the process of decluttering very soothing, especially when moving locations. It gives me the chance to start afresh rather than hold on to the past. Giving away (as gifts or donations) is always better than binning unwanted objects – at least in how it makes me feel – so I hope your excess stuff finds a new home. …But on the other hand, I sometimes get envious of the people who stay in one place long enough to accumulate homely clutter. The type of clutter you get from calling a place home for several years and makes you look settled rather than transient. I also find the decluttering process soothing. There are so many things I wouldn’t throw away were it not for moving. Old things, used things… all clutter! We’ll get our home and our “homely clutter” sooner than we’ll realise, I’m sure. You’re in the home stretch of the packing now, so just power through. I too love books (more than people) but found that an ebook reader was a great investment. I still buy physical books, but only the ones I love, know I will read again, need to use as reference. I’ve found that I read a lot more as well as more varied books than I used to. And typing is the most useful skill in the modern world. If I hadn’t taken a touch typing class in high school, I don’t know how I would have survived. As a journalist, being able to transcribe stuff in real time is invaluable. Do you also use a Kindle? I also read much more since I have it. It’s amazing to be able to buy a book right away after hearing from it. The only real books I buy are the ones on which I want to take notes. I got my ereader in Spain several years ago so it’s a weird Spanish model but it’s one of the greatest things in my life. Typing was an optional class in my high school (it should be mandatory by now, starting much earlier) that my sister basically forced me to take. The best advice I ever got. As a little kid, I went to a Montessori school where they painted each of our fingernails a color that corresponded to the keys on a typewriter toy. The idea was that we’d only touch a key with the same-colored finger. If you covered your keyboard with a temporary sticker, you could try the same thing. I like the colour idea :-) Thanks!